Guiding services, professional instruction and courses in rock climbing, mountain walking and mountain scrambling. Based in Snowdonia, North Wales with rock climbing courses also run in Sardinia. Teaches all levels of rock climbing from beginner to advanced. We are members of the American Mountain Guides Association and have been teaching climbing since 1993. Provides detailed information about climbing the western hemispheres highest peak. Equipment, climbing routes, permits, travel, sample itineraries and photos. Mountaineering and rock climbing instruction. Courses include ice climbing, backcountry ski and snowboarding, telemarking, snowshoeing, snow camping, and Mt.Shasta trips. Provides guided rock climbing, ice climbing, snowshoeing, mountain biking, fly fishing, winter camping, and mountaineering trips. Also offers wilderness survival and first aid courses. Information on rock climbing in the Bugaboos and at Castle Mountain plus ice climbing in Canada. Pictures of the above plus other areas in Canada, including Squamish. Rock climbing tours and clinics in Acadia National Park. Information on a variety of programs and rates are included. Offering all levels of rock and ice climbing instruction, personalized guiding to individuals, families and groups. Guided and instructional climbs on Mt. Desert Island, Camden Hills and Mt. Katahdin. Outdoor adventure guiding in Colorado, Texas, Mexicos Copper Canyon, Yellowstone, the Swiss Alps, Bolivia. Rock climbing, alpine climbing, mountain biking, fly fishing, and backcountry travel. Frequently asked questions about aid climbing with answers compiled from rec.climbing. Includes general discussion forums as well as special forums for ice climbing, aid climbing, bouldering, trad climbing, and competition climbing. Mountain guide company organizing trekkings trips, mountain climbing and expeditions in patagonia and Tierra del Fuego. Forums for rock climbing, bouldering, aid climbing, mountaineering, and ice climbing. A mountain sports center based in Antigua, Guatemala offering high end mountain bike tours as well as rock climbing tours, kayak trips and volcano summits. Climbing information, maps, guidebooks, and rock climbing equipment. Offers guided whitewater rafting, hiking, rock climbing, and mountain biking trips on the New and Gauley Rivers. Provides information on the trips, rates, accommodations, and reservations. Located in Hico. Located in Katoomba. Operates in the Blue Mountains and offers abseiling, canyoning, rock climbing, mountain biking, mountaineering tours and instruction for beginners to advanced. Includes details, links and contact information. If the business hours of Crested Butte Mountain Guides in may vary on holidays like Valentine’s Day, Washington’s Birthday, St. Patrick’s Day, Easter, Easter eve and Mother’s day. We display standard opening hours and price ranges in our profile site. 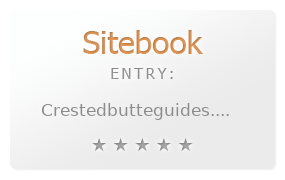 We recommend to check out crestedbutteguides.com for further information. You can also search for Alternatives for crestedbutteguides.com on our Review Site Sitebook.org All trademarks are the property of their respective owners. If we should delete this entry, please send us a short E-Mail.